A comprehensive kit consisting of the necessary Master Patterns, Instruction Book, tools and templates, to sew an entire wardrobe of great-fitting, personalised clothes all structured to fit your individual body shape and size. Your unique measurements are applied to the Sure-Fit Designs™ Master Patterns. The resulting pattern accurately reflects your body shape and circumferences. Yes…personalised fit is definitely achievable putting confidence back into your sewing! With only 11 measurements, achieve your personal body blueprint (your bodice & skirt sloper). Then countless patterns including blouses, skirts, one and two-piece dresses, jackets and coats are all possible. All well-fitting and fit just to you. 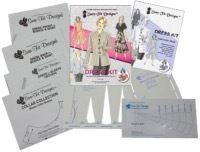 Designing, sewing instructions, fashion tips and complete patterns are all available within the Dress Kit. The Dress Kit Contents - What's in the kit? Blouses, tops, skirts, any style of two-piece or one-piece dresses, and jackets or coats can be designed with this flexible fitting, sewing & designing kit.